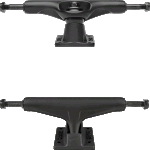 Magnesium Skateboard Trucks are the feather weights of the skate truck world. 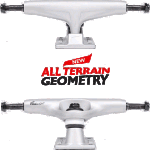 Manufactured using Steel axles and Magnesium hangers and baseplates, these trucks will give your board the highest level of pop and flip. Ultra light weight, so your board will flip faster and POP higher. Magnesium is a softer metal than the standard Aluminum, so magnesium trucks grind like butter, for the smoothest, longest grind in the game.